Tomorrow we celebrate Passion Sunday. Mark's narrative (which we read in the liturgy tomorrow) links the account of Jesus' eschatological discourse in chapter 13 with the passion narrative in chapters 14-15. Jesus’ prediction that the disciples will be handed over to Jewish and Roman authorities (13:9-13) parallels what happens to himself: he is handed over to Jewish and Roman authorities (14:10-11. 18, 21, 41-42; 15:1, 10, 15). The promise that the disciples will be betrayed by family members (13:12-13) foreshadows the way he is betrayed by one of his own disciples (14:10, 20, 43). In Mark 13, Jesus says that people will see “the son of man coming in the clouds with great power and glory (13:26). In Mark 14, Jesus tells the high priest that he will see “the son of man sitting at the right hand of Power, and coming with the clouds of heaven” (14:62). Jesus tells the apostles that no one knows when the “hour” of judgment will come (13:32). Later, in chapter fourteen, Jesus tells the disciples that the “hour” is at hand (14:41). In the apocalyptic discourse, the disciples are told to “watch” (13:5, 23, 33, 35, 37). Likewise, in the garden, Jesus tells the disciples to “watch” (13:34, 37-38). During his eschatological sermon, Jesus warns the disciples: “Watch, therefore—for you do not know when the master of the house will come: in the evening, at midnight, at cockcrow, or in the morning” (13:35). Mark links important events of the passion narrative with the evening (14:17, 15:42); night (14:30); the cockcrow (14:30, 68, 72); morning (15:1, 25). Jesus warns the disciples, “Do not let the master find you sleeping” (13:36). Later, Jesus finds the disciples sleeping in the garden (14:40). Adapted from Colin Brown, “The Interpretation of Mark 13: Jesus' Oracle Concerning the Destruction of the Temple and its Implications Following the Rejection of Jesus” (Handout, 2002), who lays out in a side-side chart the comparisons made by R. H. Lightfoot, The Gospel Message of St. Mark (Oxford: Clarendon Press, 1950), 48-59; Dale Allison, The End of the Ages Has Come, 36-38; John T. Carrol and Joel B. 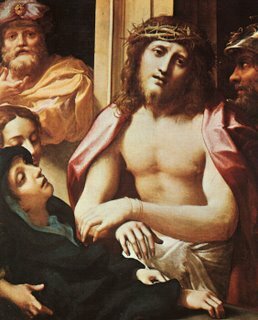 Green, The Death of Jesus in Early Christianity (Peabody, MA: Hendrickson 1995), 36-7.
any significance to the young man clad in a linen sheet who flees naked?